Cattle thieves have killed more than 20 people in Nigeria's northern state of Zamfara, officials say. 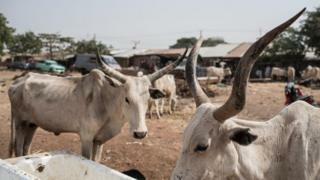 Violence related to cattle has been going on for years in Nigeria - even longer than the northern Islamist insurgency and southern oil militancy. The chairman of the local government area for Zanoka, Mustapha Muhammad, told the AFP news agency that people in the village had "buried 23 people killed in the attack, including vigilantes who tried to fight off the bandits". Most of the violence involving cattle theft is in the country's Middle Belt where cattle-herders and settled farmers compete for ever-scarcer resources, says BBC World Service Africa Editor, Mary Harper. Kidnappings for ransom have also been on the rise. In early May, about 100 people were abducted in just two days on a road near Kaduna's border with Zamfara state.